Windows 10 version 1703 update is now available everyone. The latest update brings new features and improvements to the OS. Now, you can also create more than one partition on a USB drive in Windows 10. Microsoft has released this new feature with Windows 10 Creators Update for desktop manufacturers(OEMs) for recovery purposes. This feature creates a Windows PE (WinPE) bootable USB flash drive or an external USB hard drive. The company also pointed out that the default installation runs from memory (RAM disk), so you can remove the drive while Windows PE is running. Do not remove the USB drive if you are applying an image from it. Multiple partitions on a USB drive, allowing you to have a single USB drive with a combination of FAT32 and NTFS partitions. 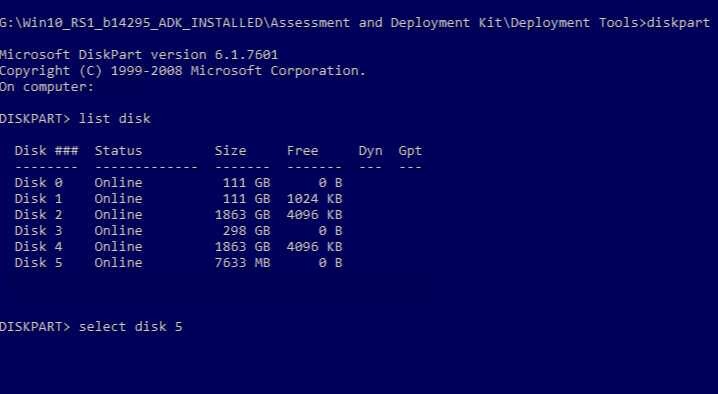 USB drives with multiple partitions will require Windows 10 version 1703, with the most recent version of the ADK installed. To prepare your USB drive, you’ll create separate FAT32 and NTFS partitions. The following creates two partitions on a USB drive; one 2GB FAT32 partition, and one NTFS partition that uses the rest of the available space on the drive.